Hello everyone! As this is our first entry in Noah’s blog, we want to talk about something close to Noah and our hearts – ART! 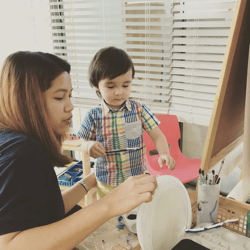 Noah loves art! This is so true as ever since he could hold a pencil, he has been scribbling, doodling and basically creating all sorts of ‘artwork’. 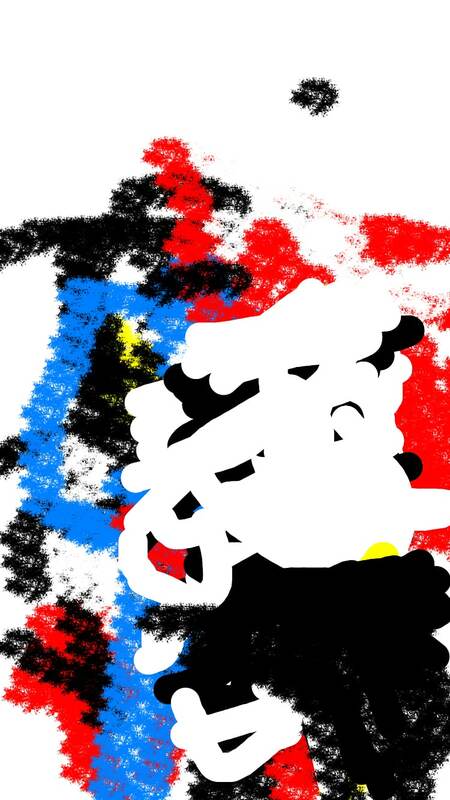 And even way before he could hold a pencil, he was already doodling on his iPad. 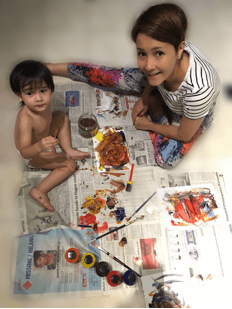 We have always encouraged Noah and his passion for art, after all, which toddler or child does not love art right? 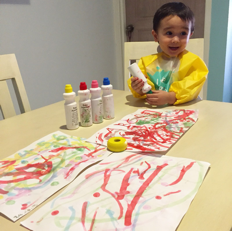 Noah likes all types of painting, with brushes, sponges and especially his bare hands! 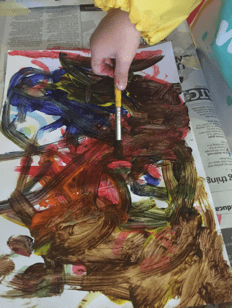 Noah loves using his bare hands to create his ‘artwork’ and we really encourage him to use them as we think that gives him a more natural ‘feel’. We also read that the arts help develop the right side of the brain. This is important as we are told that when gifted kids solve problems, there is increased electrical activity in both the left and right hemispheres of the brain. It seems that for our brain to be efficient, the two hemispheres of the brains must work together. Interesting huh? So by stimulating and exercising the right hemisphere of the brain, the arts strengthen the connection between the hemispheres. Kids should be exposed to the arts as their cognitive skills mature so that their right brain will be as developed as the left, and both hemispheres work in tandem, thus achieving the full potential of the mind. We feel that it is important for us to encourage Noah at home and also at school. In fact we are delighted that his preschool place great importance in art. So we will continue to encourage Noah to make a mess! We hope that it will help towards his overall development. And besides, it’s FUN for the whole family!